Reptile Mod 1.12.2/1.11.2 adds new reptiles with different species into Minecraft. Each of them is very useful because they drop important items and crafting materials. You can eaislly find leather, fermented spider eyes, or even chests by killing them. You can also ride the turtle, however there is no way to control it as of yet. All of these reptiles can be friendlies or enemies, you have to try and see it for yourselves. There will also be ways to breed them and ways to feed them, which you will have to find out inside the game… so what are you waiting for. 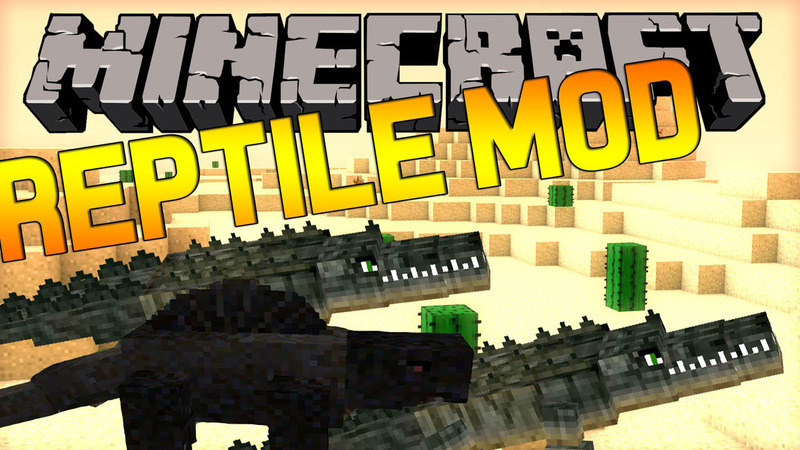 Get the Reptile mod and start breeding a crocodile. Eats cows, sheep, pigs, chickens and player! They drop leather and beef when killed. They are not tame-able. Eats sheep, pigs and chickens. Larger than the other monitors. They drop leather and beef when killed. They are tame-able and will sometimes attack players in the wild. You can breed them with raw pork, but be careful. Eats pigs, and chickens. This monitor will not attack players at all. They drop leather and beef when killed. They are tame-able and you can breed them with raw pork. Eats pigs, and chickens. This monitor will not attack players at all. They drop eggs when killed. They are tame-able and you can breed them with raw pork. This croc will attack cows, sheeps, pigs, and players, day or night. It’s strong and hard to kill. Use a weapon! Luckily this guy is slow so you can outrun it. Kinda rare, only spawn in swampland. This one also drops leather and beef when killed. It’s eyes glow at night, easier to spot that way. Credits go to Daveyx0 for the crocodile model look. Although He did a better job than I did. Here is what the croc looks like with Daveyx0’s skin. This is a small Desert turtle that spawns in desert biomes. Tame and breed them with flowers. These can spawn in most biomes that are not snow covered. Tame and breed them with flowers. These spawn in forest and jungle areas. Tame and breed them with flowers.